In Violent Hospitals, China's Doctors Can Become Patients : Parallels A triple stabbing at a Chinese hospital is the latest in a string of attacks against doctors by disgruntled patients. Policies intended to improve and expand health care have led to overcrowded facilities, overwhelmed doctors and corruption. Hospital workers protest against attacks on medical workers outside the No. 1 People's Hospital in Wenling, in east China's Zhejiang province, on Oct. 28. The protest came after a man stabbed three doctors, killing one, three days earlier. Several hundred doctors and nurses jammed the courtyard of the No. 1 People's Hospital in Wenling, a city with a population of about 1 million in Zhejiang province, a four-hour train ride south of Shanghai. They wore surgical masks to hide their identities from the government and waved white signs that read, "Zero tolerance for violence." "Doctors and nurses must be safe to take care of people's health!" video shows them chanting. The medical workers were reacting to a triple stabbing at the hospital three days earlier. Wenling officials responded by deploying dozens of riot police, further angering already traumatized hospital staff. "Withdraw the special forces," chanted the nurses and doctors, many of whom wore white lab coats. The last couple of weeks have been bad ones for medical workers in China, even by the violent standards of the country's hospitals. In addition to the attack in Wenling on Oct. 25, another angry patient in Harbin, in China's far northeast, stabbed a doctor to death. And in south China's Guangdong province, family members of a patient who died beat two doctors, leaving one with kidney damage. 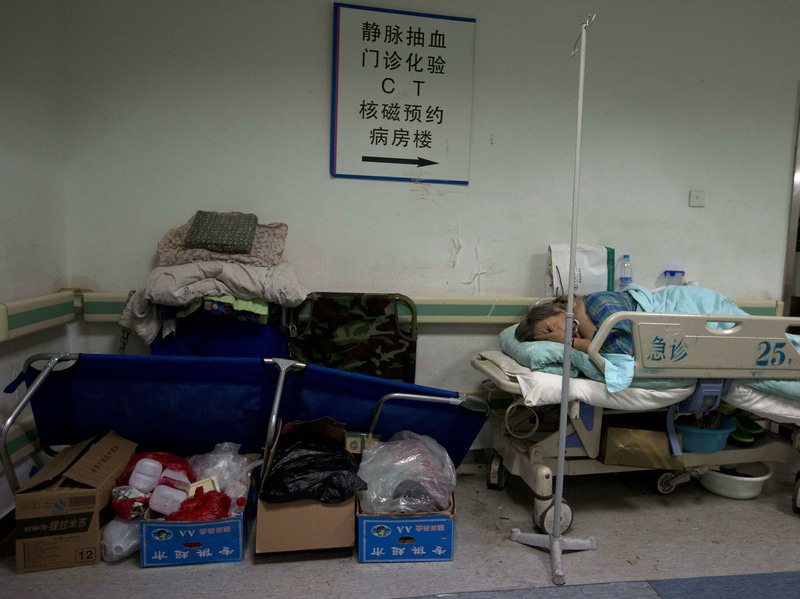 A patient rests on a bed in the corridor of a crowded hospital in Beijing. In Wenling, a patient angry over the results of a sinus operation killed one doctor with a butcher knife and injured another. After overcoming a pair of security guards, the attacker went on to stab a third doctor more than a dozen times, one of the victims told NPR. One physician at the hospital, who asked only to be identified by his English name, Dr. Jones, says medical workers here are scared. "Protection measures in hospitals are almost nonexistent," he says, speaking in a private room in a city tea house. "These security guards had no training. Actually, they can't protect us." Police arrested the attacker, Lian Enqing, who lives in the countryside, where he makes mahjong tables, earning about $300 a month. Lian's sister, Chao, says her brother was furious after spending more than $13,000 on what he saw as a failed surgery and treatment. "He couldn't sleep at night," Chao says, sitting on a hand-carved wooden stool in the bare living room of her parents' house. "He said he didn't sleep because he felt uncomfortable. He became grumpier and grumpier, even smashed things and beat people." Lian had also been diagnosed as suffering from paranoia, according to medical records, but Dr. Jones says Chinese hospitals have become such stressful places, even mentally balanced patients can snap. "There are more and more insults, threats and attacks on medical staff," says Jones, in defiance of a hospital order that employees not talk to the news media. "Actually, every day patients insult doctors." 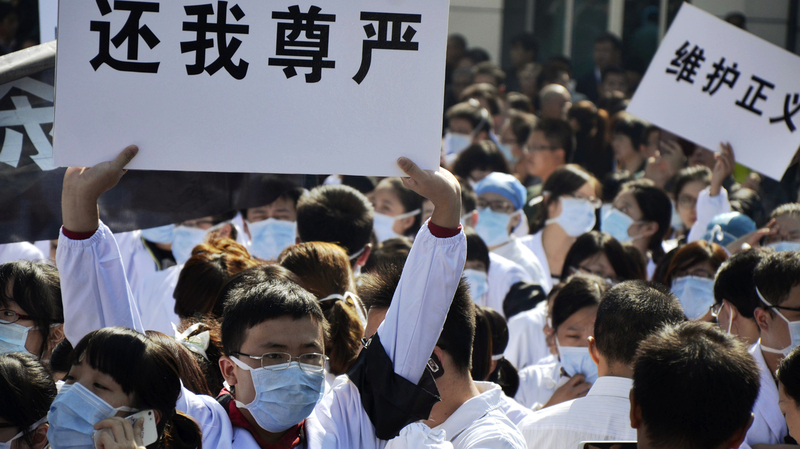 Last year, seven medical workers died in attacks in China, according to the state-run New China News Service. Patients and their family members assaulted staff at more than 60 percent of hospitals, according a survey by the Chinese Hospital Association. The survey also found that nearly 40 percent of doctors have considered quitting and nearly 1 in 6 say they'd never let their child study medicine. Dr. Jones says the problem is that government policies intended to improve health care actually pit doctors against patients. In recent years, China's government has extended health insurance to more than 90 percent of the population — a huge improvement from a decade and a half ago. People wait in line at a counter for medical services at the Guanganmen Chinese medicine hospital in Beijing. But out-of-pocket expenses are still very heavy and millions of patients with high expectations now flood city hospitals, often overwhelming staff. "The intensity and pressure of our job are tremendous," Jones says. "Sometimes you can hardly imagine it. I see 70 patients every day, generally no more than five minutes at a time. It's unavoidable that patients are dissatisfied." For all that work, though, first-year doctors in Wenling earn less in base salary than the man who attacked them last month, and Jones says physicians are expected to generate huge fees for the hospital through drug sales and procedures. This has lead — by all accounts — to rampant corruption across the country. As a teenager in the 1980s, Lijia Zhang worked in a missile factory where the state provided all health care. The system was incredibly wasteful. Zhang, who wrote about her experiences in the memoir Socialism Is Great, recalls medicine was so plentiful, workers used to throw pills at each other for fun. China shifted from a command economy to a more market-oriented one and turned hospitals into profit-driven ventures. A few years ago, Zhang says, an anesthesiologist shook her family down for bribes over surgery for a cousin, who was dying of leukemia. "He demanded about $3,300," Zhang recalls. "My cousin's family was poor. We all had to chip in money. The reason we paid the money is we thought the operation was very dangerous. We thought if we didn't pay, it may jeopardize the health of my cousin." After paying bribes, if a surgery goes badly, many patients are understandably enraged. 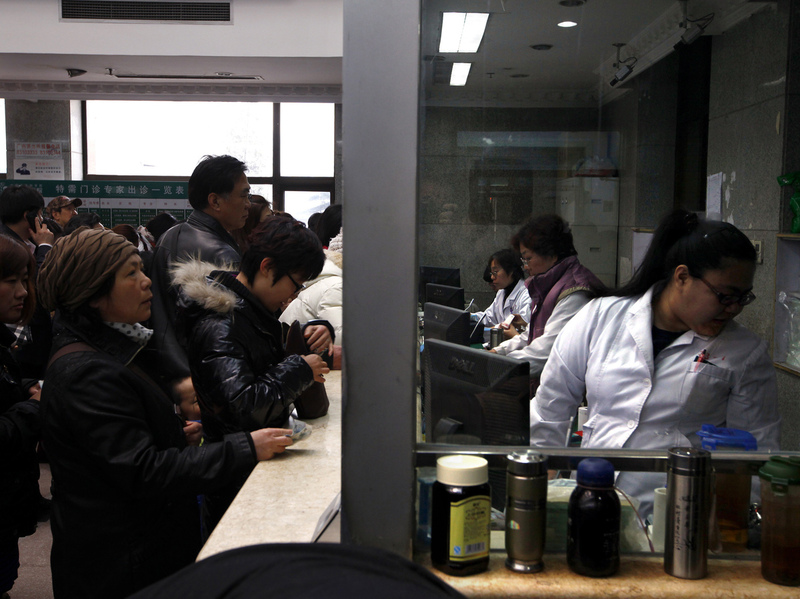 China's government is pressing hospitals to beef up protection. Last month, the Ministry of Public Security told medical centers with more than 2,000 beds that they had to have at least 100 security guards. But the government must do much more, says Yanzhong Huang, senior fellow for Global Health at the Council on Foreign Relations. "I don't think that simply pouring more money into the health care sector would solve the problem," he says. Instead, Huang thinks the government needs to encourage more competition from private hospitals to — hopefully — increase efficiency and drive down costs in a system dominated by public medical centers. The government also needs to strengthen China's medical malpractice claims process, so patients can turn to the courts with confidence. "If you don't have legal, institutionalized channels to address the disputes, then the patients have no other alternative but to rely on violent means," Huang says. Unfortunately, China's leaders have a full plate of economic issues to address in the coming years. Hospital reform is not high on the agenda and attacks are likely to continue.